This week, DNR will start removing nearly 900 derelict, toxic, creosote-treated pilings and 5,000 square feet of old, dilapidated dock and other structures along a 40-mile stretch of shoreline in eastern Jefferson County. Map of removal sites. Click for larger version. The project involves seven sites, starting just north of the Port Townsend Channel and moving southward to Point Whitney in Hood Canal. One of the structures scheduled for removal is the old 4,200 square-foot Southpoint ferry dock, which served the ferry run from Lofall in Kitsap county. This site will involve the most work, with contractors removing the old dock, a timber trestle, the wing walls—the v-shaped structures that guide ferries into the landing docks—and all the associated creosote-treated pilings. Why is DNR removing old creosote-treated materials from Puget Sound? Creosote contains hundreds of chemicals, some of which are highly toxic. Originally used as a wood preservative and to fend off insect infestations, creosote was certainly effective at doing its job. Unfortunately, the toxic chemicals from creosote pilings and structures continue to leach into our marine waters long after the useful lifespan of these materials. 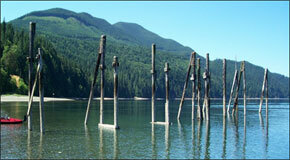 DNR is leading the effort to remove creosote-treated materials throughout Puget Sound. Projects include removing old pilings and structures that are still in place as well as the debris that washes onto to our beaches, lagoons, and estuaries. CBC Victoria radio podcast with Monica Shoemaker, DNR restoration manager.